Free Shipping (within NZ only) for all orders over $40 • Flat Rate Shipping for International Orders ($15) • Cheers! The journey began in 2011 when a UBfree (UB Free Ltd) co-founder Christina Clifford (pictured above) suffered nasal congestion, heart palpitations and over-heating after drinking wine. Being a person who appreciates wine, she was disheartened at the thought of no longer being able to drink wine due to the nasty side-effects of added sulphites. Her partner, a business analyst began researching sulphites and the role they play in our bodies. Through his connections in the scientific and wine industry the first UBfree prototype formula was created. The results were astonishing. 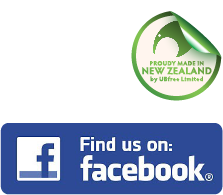 Over an 18 month period the UBfree formula was vigorously tested and refined at the world-class New Zealand Cawthron Institute. The research continued with UBfree appointing an award winning food scientist to oversee the development. In the final stages of product refinement UBfree was put before an Oenologist for tasting who made the following comments “It’s like you have taken an old flabby wine and made it young again. The taste is brighter, fresher and the tannins have become smoother… the fruit notes have become more dominant”. 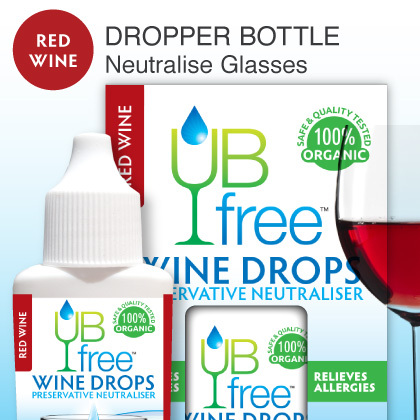 UBfree have discovered a way to instantly cellar young wine. The final (patent-pending) formula effectively reduces the sulphites in red and white wines. UBfree also enhances the flavour of younger sulphite-heavy wines. UBfree embodies the spirit of the place where it was created; New Zealand, a country well-known for it’s pristine environment, boutique vineyards and award-winning wines. UBfree uses only 100% natural organic ingredients. UBfree meets the Food Safety Regulations for New Zealand and Australia. 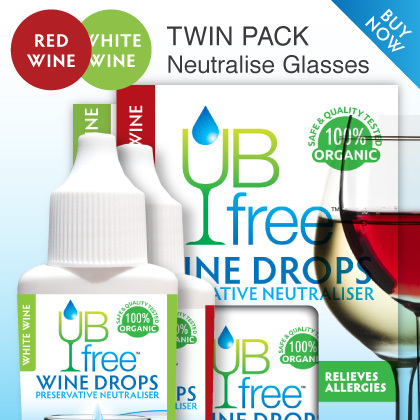 Through diligent research and hard work UBfree Ltd are thrilled to offer a product that allows wine drinkers ‘A Healthy Choice’.